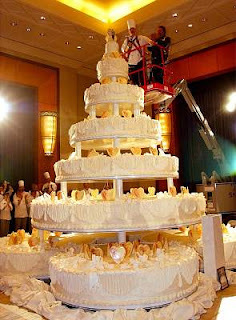 African American Brides Blog: World's Largest Wedding Cake? The Mohegan Sun says it is. The casino unveiled the seven-tier monstrosity at this year's New England Bridal Show. The wedding cake is 17-feet-tall and it weighs 15,032 pounds. It's almost three-times the weight of the current record in the Guinness Book of World Records for the world's largest wedding cake.